The warning alarms should have gone off in my head as soon as I was outfitted with a mountain bike and a sturdy helmet for what I had at first understood to be a nice leisurely bike ride in the Vietnamese countryside. No, who am I kidding — the alarms should have started wildly blaring as soon as I heard “Hanoi” and “bike ride” in the same sentence. And yet there I was on a busy Hanoi street, picking out a helmet and a sturdy mountain bike. It sounded good in theory. As most crazy things do. The traffic in Hanoi lives up to the stories you've heard about it — of a wall of buzzing motorbikes; of the fact that you are better off crossing the street with your eyes closed, hoping that the honking horns will find their way around you. Simply LOOKING at the traffic made me nervous. And yet I soon found myself in the thick of it, half of me praying to God and the Buddha at each intersection that I would survive the ordeal, and the other half laughing absurdly at how crazy it was. Cycling in Hanoi certainly is an experience. My group attempting to merge into traffic. To be fair to our Vietnam Velo guide, he was telling the truth when he said that the amount of riding we'd be doing in the city itself was minimal. We had to cross 2 major streets, but then soon were riding across an old railroad bridge and carrying our bikes down to the river flats for some much less-trafficked trails. 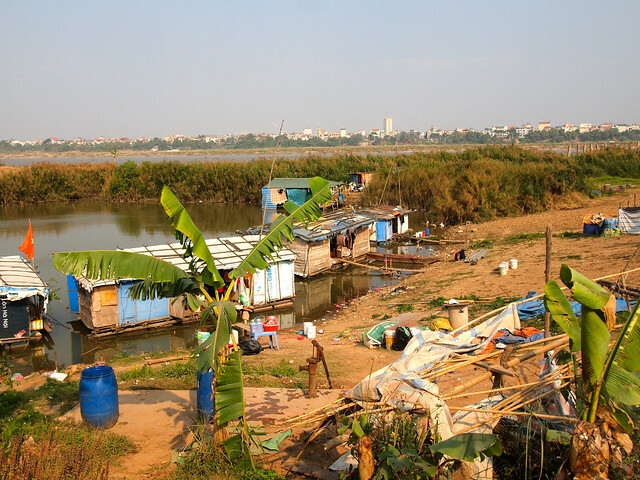 Down on the flats of the Red River, it was hard to believe that the honk-happy city of Hanoi was anywhere nearby. 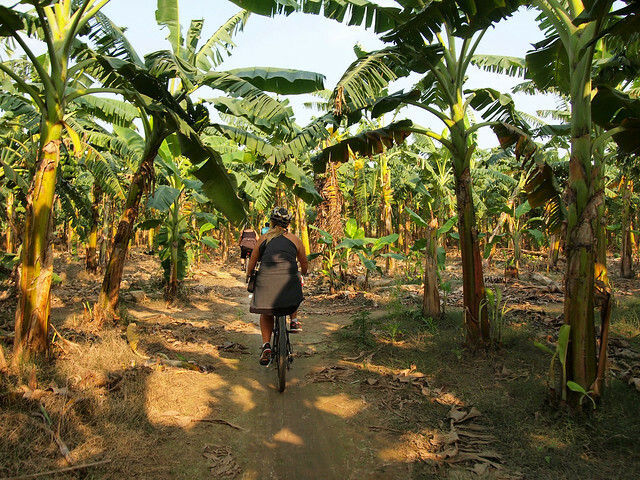 As we rode on rutted paths through fields of crops and “forests” of banana trees, it was incredibly quiet and… well, rural. We stopped constantly along the way — to meet families who lived in the middle of their fields or (illegally) on the riverbanks in little shacks. 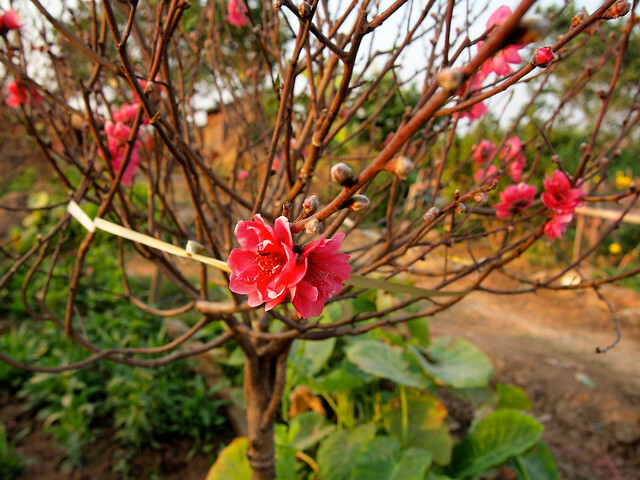 We visited farms that were selling peach blossoms and kumquat trees leading up to the Lunar New Year Celebration of . 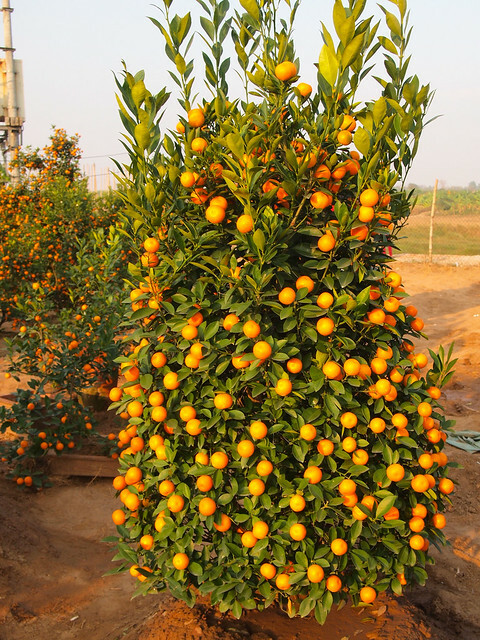 Here in Vietnam, you buy a kumquat tree for Tet the same way that we North Americans buy pine trees for Christmas. So, why the mountains bikes, you ask? Well, they certainly weren't to help us through the Hanoi traffic. Even though this cycling tour was advertised as “easy,” the trails were actually anything but for most of our ride through the river flats. They were often narrow, rutted, sandy, and otherwise challenging. So much so that 4 people (out of a group of about 14) fell off their bikes, one hitting her helmeted head hard enough that we feared she had a mild concussion. While the falls were unfortunate (and even a little scary), a bike tour like this was the last thing I expected to experience in a city of 6.5 million. I would do it all again — including riding through that insane traffic! 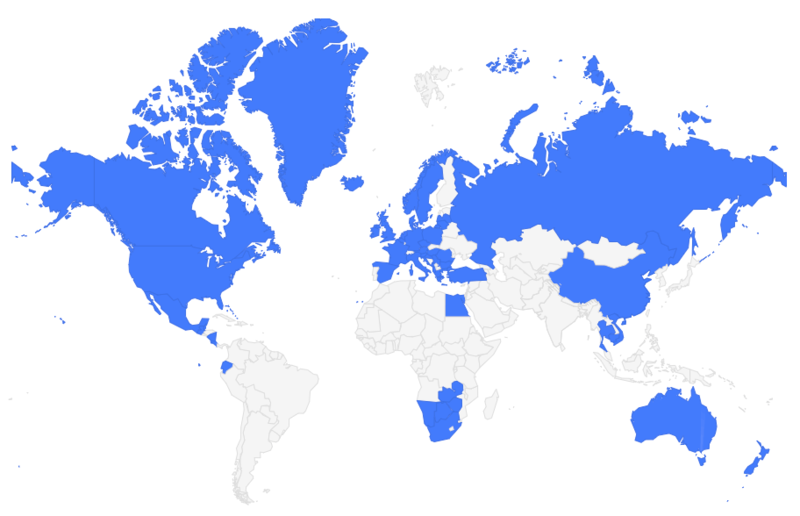 After all, what is the point of traveling halfway around the world if you're not up for a little adventure? DO THIS TOUR: I went on this tour as part of a larger group tour of Vietnam, but it can be booked on its own through Urban Adventures. The tour is called . The tour was very professional, and we had not only a guide with us, but also a bike mechanic. 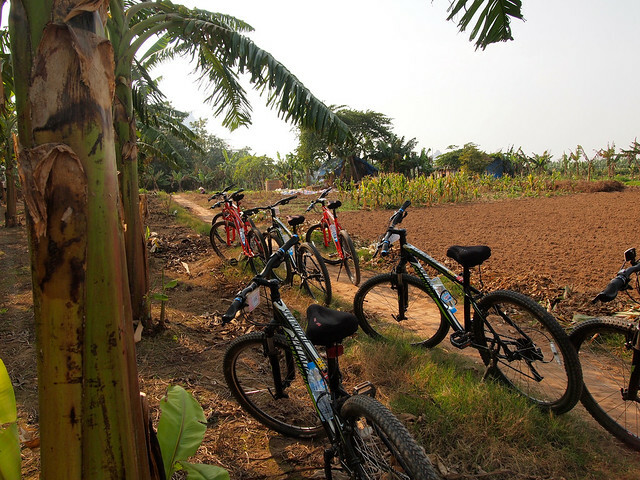 You should have some cycling experience for this tour, as you do ride briefly through Hanoi traffic, and on uneven trails once you get out into the countryside. 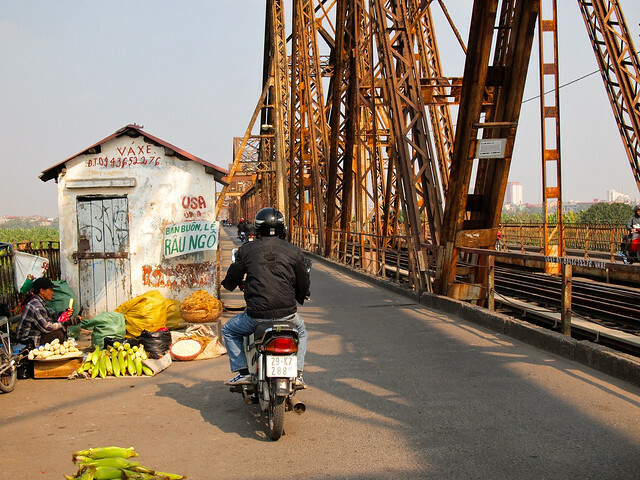 Would you be crazy enough to go on a bike tour in Hanoi, of all places? *Note: I visited Hanoi as part of a complimentary tour of Vietnam and Cambodia with Intrepid Travel. I paid for this bike tour on my own, however. Such lovely pictures really! I’d love to go on such a cycling tour. The oranges look so pretty! It was a really unique way to see the countryside, and to see how the locals were preparing for Tet! Hahaha, yeah, this one was definitely not for beginners, or for people who don’t feel comfortable on a bike! 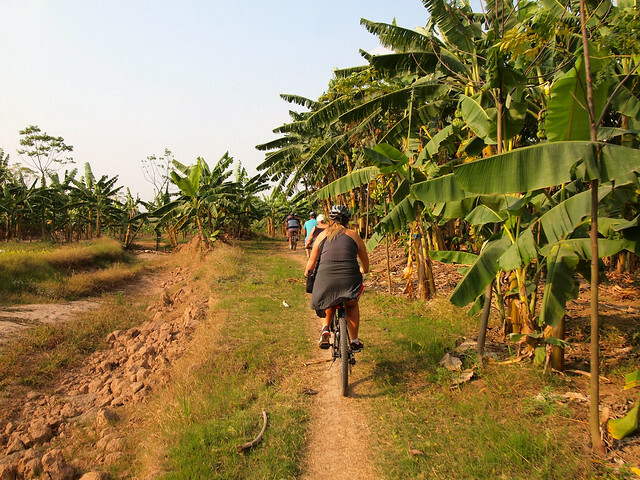 I also did bike tours in Hue and Hoi An – all were great! Sounds both terrifying and fun! But I’m sure the peaceful and picturesque countryside ride far made up for the stressful city setting. 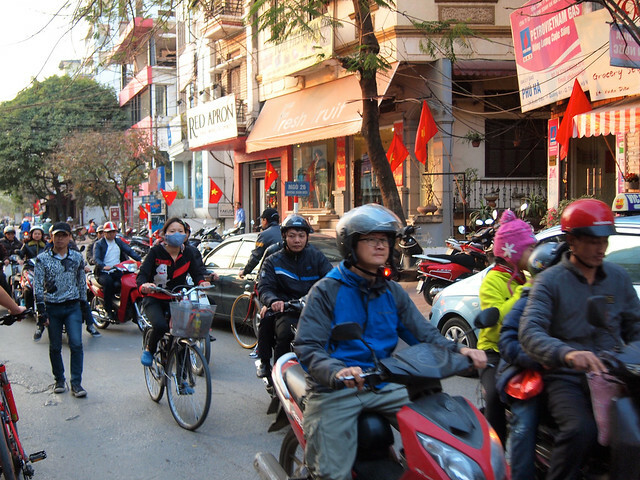 Biking in Hanoi sounds terrifying! Glad you got out of there quickly. But riding through the countryside sounds amazing. I love riding bikes in new places. I really love bike tours in new places, too. You get such a different impression of a place on a bike, I think. Bikes are a great way to slow down and see the world. That said, I’ve done a certain amount of riding in Argentina, which usually involved an hour long commute through traffic to get to the countryside and I totally understand how terrifying that can be….I got really good at banging on the taxi cabs windows when they tried to merge on top of me. Yikes. Not an experience I would repeat if possible. Glad you had a good guide and a mechanic on hand! Yeah, riding in that chaotic traffic was really stressful! Most bike rides I go on tend to be on the more relaxed side. What an awesome experience! I would definitely do this. Great pics!!! Well if you are ever in Hanoi, go for it! Cycling tours might be my favorite kind of tours. You’re active and engaged, and at the same time seeing a really cool side of a new place. Looks like you had beautiful scenery to ride past Akatuki. I would love to do something like this one day when I visit Vietnam but unfortunately I have never learnt to ride a bike and the very thought of it makes me so scared. I don’t think the crazy streets of Hanoi would be a good place for me to start, that’s for sure! Haha no I would definitely not recommend learning to ride a bike in Hanoi! Sounds fun! After you get out of the city, that is. I know it is definitely not easy to ride on those sandy, rutted roads though. They were tough in Myanmar and left my bum sore for a few days after. Oh my gosh, yes!! My bum was SO SORE from this ride. But then I did another cycling tour 2 days later, and another one 2 days after that. Haha. 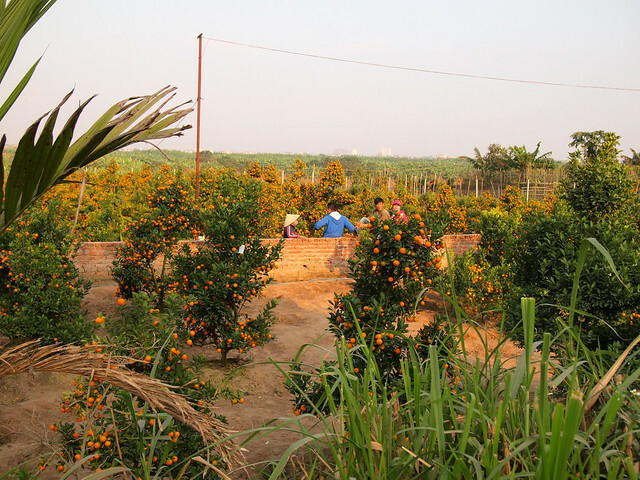 Those kumquat trees are stunning! I’ve only ever seen tiny ones. 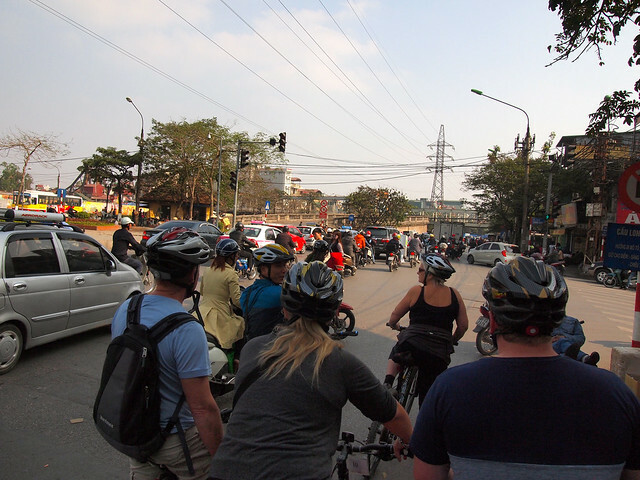 I love biking in new places but don’t know if my nerves could have handled the craziness of Hanoi! I found biking in Brugge’s city center on a Saturday with the mobs of tourists to be crazy enough. Biking in the Vietnamese countryside looks idyllic though. 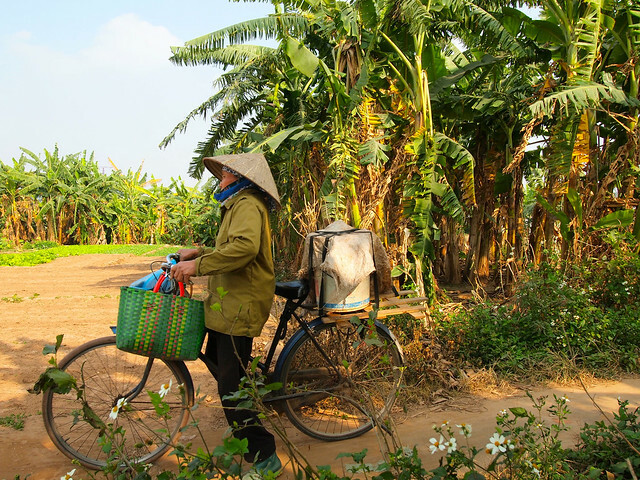 The Vietnamese countryside is pretty much MADE to be explored on a bike! 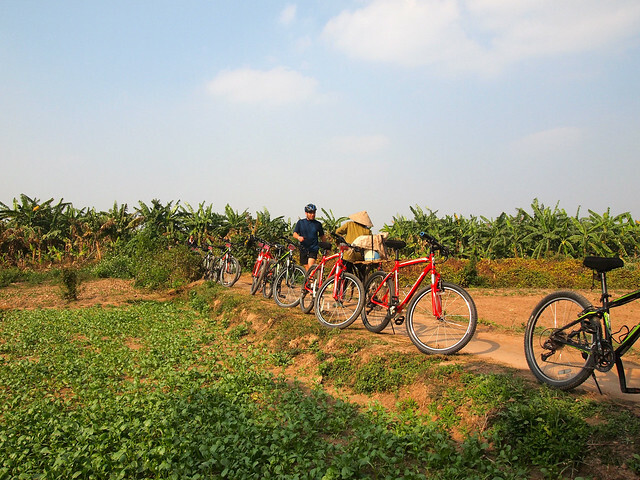 I did cycling tours in 2 other Vietnamese cities, as well, and loved those, too. But yeah… definitely just dove in head-first in Hanoi! Beautiful – and you’re right, it looks so quiet and peaceful. I would never have guessed this was within cycling distance of Hanoi! Would love to go there someday and do this excursion. It looks like a great break from the city. 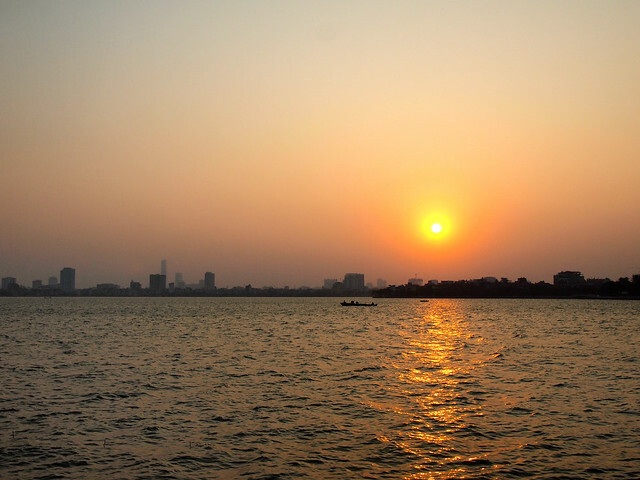 It was crazy because at times you could see the Hanoi skyline, but you couldn’t hear any city noises at all! It turned out to be a really fun day! Haha, I think a lot of things in Hanoi seem a bit “death defying”! Seriously though, I love that place. And you took some amazing photos. Looks like you had much nicer weather than when I visited. Haha so true! Even just crossing the street requires some survival tactics. It was really smoggy when I was in Hanoi, but sunny at least. Whoa, I had no idea that this was even available in Hanoi – kudos to you for finding it & sharing the adventure! Haha, the benefit of having a local tour guide, I suppose! So glad I ended up doing it. Whoa, would definitely not want to cycle through Hanoi. Scary! Otherwise the tour sounds intense, but really, really nice! 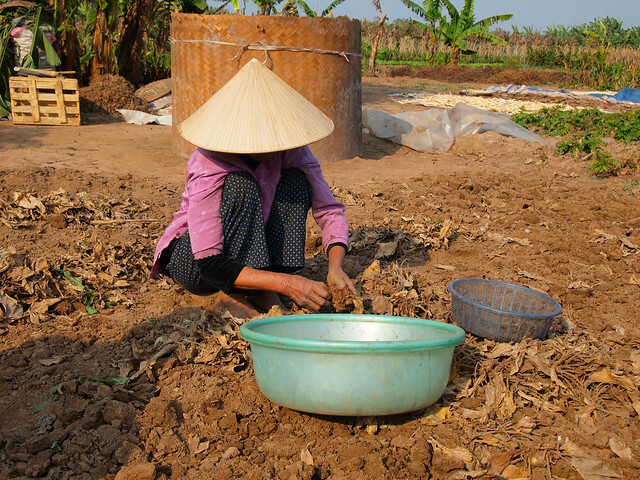 I only spent a few days in Hanoi and wish I had time to get out into the countryside. I guess I’ll just have to do it vicariously through you instead. Intense is definitely a word for parts of it! But I’m really glad I did it. Don’t let anyone ever tell you otherwise: There’s no shame in training wheels! You are BRAVE!!! No way would I do that in Hanoi. It would definitely be cool to see the countryside on bike. We were very close to doing a motorbike tour but were derailed in the end by illness. Ah, too bad! Motorbikes would probably scare me more though – I couldn’t bring myself to ever try one here in Asia! I’ve heard too many horror stories of bad crashes. Give me a push bike any day! That is scary! That was really brave. But then it seemed rewarding once out of the city! Yes, definitely was rewarding! Challenging, but rewarding! Cycling in some cities does seem like a death wish, but I love getting around on a bike so much. I don’t know that I would want to use a bike as transport in some of the huge, congested cities I’ve visited. But I do like taking chilled-out bike tours when I travel.